Stress biases decision-making strategies. It makes sense that short-term stress leads to more of the same actions (very strong stress will result in the binary flight or fight action response), while chronic long-term stress leads to less of the same, because it is time to try something new. Basically depression is the demand of the body to try something new, to find new goals, to do less of the actions which led to the current unpleasant situation. As if the body is saying “do anything, but don’t do this anymore”. P.S. Recent studies have found that depression in form of prolonged stress exposure causes architectural changes in prefrontal dendrites. Chronic stress is known to damage, degenerate and shrink the hippocampus, and it impairs prefrontal cortex-sensitive working memory. A mechanism which degenerates the PFC will help to give up unrealistic dreams and unachievable goals. Update (14 Mar. 2010) : P.S. Recent articles in the NYTimes and the Economist (named Depression’s Upside and The evolutionary origin of depression) support and confirm the idea that depression is probably linked to how willing someone is to give up his goals. Pain and low mood are warning mechanisms. Both are a natural part in dealing with failure. It is healthy for an organism to experience a decline in motivation if a goal is unreachable or dangerous. Pain stops you doing pursuing goals that damage the physical integrity of the body. Low moods and depression stop you pursuing overly ambitious or unreachable goals in general. In this sense, depression is a natural “give up” mechanism that protects an organism. I don’t recall the source, but I believe it is fairly well established that those who are depressed make better estimates of the future. Those who aren’t depressed tend to be too optimistic. 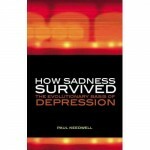 Very interesting theory the one about depression having evolved as a protection again extremely high expectations. I think it is excellent this theory. Although it is probably not that simple the explanation of the causes that originated this illness.